In 2016, Ben Scholzen and Rasmus Schultz published their PHP RFC: Generic Types and Functions, aka The Generics RFC. Having worked with generics in other languages, I was very grateful and thrilled to come across this RFC, as I could immediately see the tremendous benefits this would bring to the PHP ecosystem. With this said, the benefits of generics can be difficult to understand without having worked with them. This article was published in the November 2018 issue of php[architect] magazine. See how it looks in the published magazine by downloading the Free Article PDF. Generics were introduced in C# 2.0 in 2005. With this said, generic programming can be traced as far back as 1973 with the ML programming language. Languages supporting generics include Ada, C#, Delphi, Eiffel, F#, Java, Rust, Swift, TypeScript, and Visual Basic .NET. Languages supporting parametric polymorphism include ML, Scala, Haskell, and Julia. C++ and D support templates. Consider the example in Listing 1 in PHP 5.6. Defining type system is no easy task. For example, Ruby describes its type system as being “dynamic” and “loosely typed,” but they don’t allow you to put return types on methods, or types on method arguments, which is really like not having a type system at all. What are currently referred to in PHP as type hints are more than that: they’re contracts enforced by the compiler; it’s just that they are optional. But if you do use them, they are enforced in a helpful way. The very bare minimum requirement for even claiming to have a type system is to be able to define types on method arguments and method returns, which we have in PHP 7. A type system allows us to enforce the correctness of a program, in terms of specifying the accepted inputs and outputs. Why does this matter? If I were to remove UserRepository from the UserRegistrationService constructor’s method signature, I would not know I did something wrong until later when invoking the createUser() method. It would then try to call some method named saveUser on a Duck, and this method may or may not exist, but we won’t know that until the code is executed. If a system is going to fail, it is more helpful for the system to fail earlier than later. Leveraging a language’s type system puts us in a position to do just that. Before we run our code, static analyzers or even our code editors could highlight potential errors. Similar advantages can be derived from method return types and class property types. PHP 5 gave us optional types for classes, interfaces, and callables on method arguments. PHP 7 introduced scalar types on method arguments and gave us optional method return types. It is important to note, as of this writing, PHP’s type system has always been optional, and will likely continue to be. This reduces compatibility issues while promoting adoption. You can gradually add types to function signatures and then, hopefully, remove a lot of boilerplate code from your functions which checks argument types. With PHP 7.4, the earlier example might look like Listing 2. 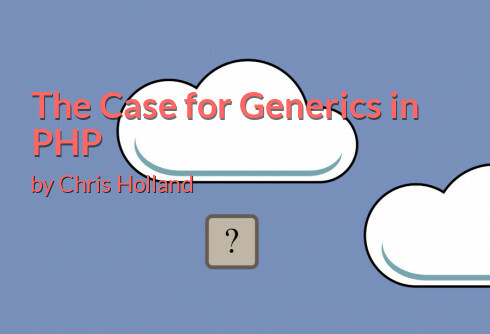 So what’s the deal with Generics? Let’s start with another example. As the method name indicates, we want to return a list of users. How would I signal this in the method signature? As of PHP 7, there isn’t a way for me to natively signal “This method must return an array of user objects”. I can do it with an annotation and hope my IDE will enforce this behavior throughout the system, see Listing 3. * @return User  //<-- this is me using an annotation as a crutch. There are richer ways to express such collections beyond a primitive array. The Doctrine ORM provides us with an ArrayCollection class. It exposes a set of helpful methods to iterate through and manipulate members of a Collection. Without generics, if I wished to enforce homogenous ArrayCollections, I might resort to a less-than-elegant hack as in Listing 4. I could also make a DuckArrayCollection (Listing 5). Every time I wish to have an ArrayCollection of homogenous items, I have to make a new ArrayCollection class to enforce this contract. This would allow me to write the code in Listing 6. // type-specific collection class for "User"
// type-specific collection class for "Duck"
My ultimate wish would be to signal that the method would return “an ArrayCollection of User objects” without creating a new child class for every type of object I might return. It’s an ArrayCollection whose members are only allowed to be instances of the User class. Here’s a possible evolution of the previous example. The brackets syntax is common in many languages to designate arrays, but this isn’t what we’re working with here. In the end, what we are trying to define is a composite type. It’s an object of a given type—ArrayCollection—made of objects of another type—User. The collections examples look tedious. Generics would allow us to remove this tedium, as in Listing 7. The letter T acts as a placeholder for whichever type I need to bind my GenericArrayCollection, and this binding happens at instantiation. From here on, the add method will only accept a Duck. And the next method is guaranteed to only ever return an instance of Duck. Based on the above examples, from this single GenericArrayCollection class, I can now write Listing 8. //$nextUser is guaranteed to be a User object. With this generics syntax, our UserLookupService class could now look like Listing 9. With the above example, we are now guaranteeing the method would always return a collection of User objects. This would help IDEs enforce proper behavior in their static analysis while providing deeper auto-completion. Without even using an IDE, PHP would throw helpful errors as soon as it parses the getUsersByDepartmentName method. Should its contents attempt to return anything but a collection of User objects, PHP would immediately tell us that what we’re trying to do is incompatible with the method signature. This is preferable to encountering an error upon system execution while running logic invoking the getUsersByDepartmentName method. It would break in unforeseen ways when faced with a stray Duck within what it otherwise expects to be a collection of Users. In these use-cases, systems will be made more robust from clearly signaling what types of objects are to be used as inputs and outputs, such that, a returned cached object might be contractually obligated to be a User, and not a Duck, for example. Beyond those examples, we might organically come across a need to leverage generics whenever we find ourselves using mixed as the return type, or the argument type of a method. Typically, our intention is a given instance of our class should only interact with objects of the same type. Our class might not care as to what that specific type might be, it just knows throwing mixed types at the same instance would result in disaster. Generics help re-enforce this expectation. As mentioned above, the concept of Generic Programming predates Java by decades, and so do type systems in general. 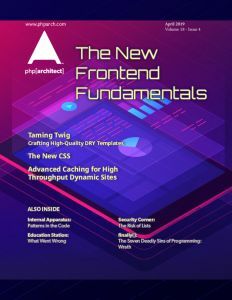 Learning the strengths of other languages and adopting some of their more useful features will help keep PHP a competitive ecosystem while making itself more attractive to developers from other ecosystems. For example, one of my first hires in our Austin office is a Software Engineer with little previous exposure to PHP, but had significant experience building systems with C#, using Test-Driven Development and applying best practices of object-oriented design. Working in PHP wasn’t much of a hurdle, because in the end, it all came down to familiar constructs: interfaces, abstract classes, classes, and private/protected/public member variables and methods. Generics are just one more construct leveraged by many software engineers across various ecosystems, who might be attracted to another language with a well-evolved type system. While the syntax and error signaling won’t be as robust and powerful as natively-implemented generics, Labarge’s framework should help illustrate generics behavior and some of its benefits. Head over to GitHub to follow the current Generics RFC. The Generics RFC may have been a bit ahead of its time to truly get the traction it deserved. Generic types only make sense in languages where a type system is pervasively used, and their type system is fully-featured. With the adoption of typed properties, PHP 7.4’s roadmap is about to get us there. As PHP’s type system evolves and matures, and its adoption increases in modern software systems, generics would provide a richer vocabulary to build more robust systems with reduced code-duplication. PHP 7.3 is On Track! by Damien Seguy. September 2018. Testing Strategy With the Help of Static Analysis by Ondrej Mirtes. April 2018. Evolving PHP by Chris Pitt. March 2018. Episode 15 of php includes Chris Holland discussing his article. But honestly, if there’s one thing I miss on a day-to-day basis in PHP, it’s enums. Good to see an article has been written here regarding this. From my impression, this could only mean that adoption/progress to this implementation is on its way in PHP, and finally. The longest the Generics are processed with I am super happy for PHP to keep syntax standard. – Allowing multiple definitions (this is without the use of parameters but options per parameter). From RFC is Nested Types which is awesome (also entering the world of chaos itself). Note, ircmaxell (A. Ferrara) implementation is far more interesting. A programmer was considering a problem they had to solve and decided to use generics. Now the programmer has two problems.